We have all had our brush with the virtual reality technology and headsets, even if we don't own them. It is the most prominent technology that is predicted to make an indubitable impact on fields like gaming, tourism, training, entertainment, etc. But another field, that is seeing a steady rise in generating new use-cases for virtual reality, is healthcare and medicine. "The global market for virtual reality in healthcare is projected to reach USD 3.8 billion by 2020," according to a report by Global Industry Analysts, Inc. According to another report by Statista, "by 2020, the virtual reality industry will reach revenue of USD 21.5 billion." These reports show that virtual reality in healthcare will be a sizeable chunk of the total market. There are many advantages of virtual reality in healthcare domain and as the technology grows and richer VR content is generated, it will see even greater adoption and better results. Virtual reality is an immersive experience where the user wears a specially designed VR headset that creates a virtual environment with the use of three-dimensional images, audio, optics, motion sensing, eye movement tracking, head movement tracking, and so on. When users wear the head-mounted VR goggles, they are transported into a 3D world where images change based on their perspective and body motions. This creates a virtual environment that feels real; for instance, experiencing a roller-coaster ride through VR without actually sitting on one. Let us now talk about some of the practical applications of virtual reality in healthcare and how virtual reality is improving healthcare. For patients who are not very motivated or are not able to achieve results with will-power, and for young kids in need of physical therapy, practical uses of virtual reality is many. For instance, a patient undergoing therapy for the arm will have to perform certain functions with some arm movements to achieve some specific goals in the VR game. Such kind of virtual reality experiences are making physical therapy much more enjoyable and goal driven. Patients are also noticing faster improvements by aiding their therapies with VR. Moreover, such therapies can be done without the presence of a therapist, thereby making it accessible to people who want to do it on their own. A lot of the pain that we experience is in fact the anticipation of pain signals sent by the brain rather than real pain. Very often, by diverting our attention we are able to take our mind off that pain and feel better. Virtual reality is helping patients with chronic pains to achieve relief. In fact, several hospitals are offering patients who cannot take anesthesia or are too fragile, to opt for virtual reality during minor procedures. It is also helpful in calming down children during a stressful hospital visit. VR is now being used at many healthcare institutions while treating burn victims. Bandaging a burn patient and skin-grafting are considered highly painful procedures and to soothe that pain to some extent, the patients are given VR headsets so that they can focus on something more calmful rather than pain. Some doctors even feel that VR can be prescribed to patients with minor pains, instead of pain-killer meds. Virtual reality in healthcare in 2018 is all about helping patients who have suffered a physical trauma, balancing issues, and many other such cases. Patients recovering from such medical conditions have shown a tendency to recover faster when using VR based rehabilitation therapies. Another great use of VR is for rehabilitating patients who have lost a limb. Sometimes, patients who have lost a limb like a leg or arm, feel phantom limb pain from which they are unable to find relief. The traditional therapy for such pain was to use a trick mirror so that the patient can imagine that non-existing limb and relax it through the mind to achieve relief. With virtual reality, this task has become easier and faster. VR can enable the patient to even perform functions with the missing limb, thereby releasing stress and stopping the phantom limb pain. VR can immensely help people suffering from cognitive issues or social anxiety such as patients with ADHD. It is one of the most practical uses of virtual reality in healthcare. Virtual reality can help them function well in day-to-day tasks by slowly exposing them to various scenarios in a safe and comfortable manner. Patients with PTSD who have witnessed traumatic incidents are always troubled with those events and feel anxious or agitated when they come across something similar in real life. With the use of virtual reality, PTSD patients are exposed to life-like situations in a safe and controlled environment so that they can learn to deal with the triggers of their problems. Another use is for patients suffering from autism. With VR they can be trained to meet people, understand facial expressions, pay attention to body language, and become more functional in society. Patients feel depressed while they are recuperating in the hospital or at home. There are cancer patients who are undergoing chemotherapy, patients who are suffering from long term illnesses, patients undergoing dialysis, patients that are disabled and cannot do certain functions, patients getting several types of scans, and many such scenarios where they are stuck and must bear the discomfort. Such patients can easily use VR headsets to focus on entirely different things and make their medical treatment less stressful. They can go into the virtual world and feel like they are running, even while they are bed-ridden. VR can be hugely successful in treating patients with fear, phobias or other psychological disorders. Patients suffering from specific fears are slowly introduced to their fears through VR and the level increases as they gain confidence and overcome their fears. VR can also be used to assess the level of brain damage in patients by designing a series of tests that can be taken through VR headset to analyze brain activity of the patient. Today, doctors are also experimenting with certain VR based physiological tests and finding better outcomes. When it comes to highly complex operations that require precision and detailed planning, virtual reality is becoming the game-changer. VR is helping in planning for intricate surgeries pertaining to vital organs or, for instance, separation of conjoined twins, removing cancerous growths, and many other unique cases with no precedence. Images from MRI, CT scans, X-rays, ultrasounds, etc., from the patients are taken and converted into a detailed 3D and interactive virtual image which doctors can study using the VR headgear. It's like they get an ability to literally take a peek inside the patient, see the various layers up-close, anticipate complications, and prepare for the surgery even before making the first incision. This has resulted in increasing the success rates of such surgeries. Training doctors for surgery is a time-consuming process and the skills are acquired over the years by peeking over the shoulders of other experienced doctors. With the use of virtual reality, all type of operations can be virtualized, and young nurses and doctors can conduct surgeries virtually and learn at each step. They can perform virtual surgeries that are done by doctors not only in their own hospital, but all over the world. Although, this is not akin to real-life experience, it is a great way to practice and learn the process involved. VR has the power to take doctor training to the next level. Outsource2india is a 19-year old ISO-certified company which offers a complete range of cost-efficient healthcare BPO services like medical billing and coding, claims adjudication, teleradiology, pharmacy business services, medical transcription, software development, animation and illustration, and other customized services. 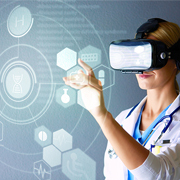 We have the right infrastructure, thorough knowledge of the medical field, so we can also help you leverage the advantages of virtual reality in medicine by creating VR content that is rich and powerful. O2I always remains at the forefront of virtual reality in healthcare in 2018 and we continuously strive to align our services to meet the futuristic demands of our clients. Reach us now so that our experts can help you with customized healthcare BPO services to bring your business the best ROI.